Five happy pilots leisurely folded up their wings in a big empty playing field adjoining a large pond, having landed out after a beautiful eighteen mile downrange jaunt. The sun was shining, birds were singing, maybe angels too, and a lone blue helicopter buzzed quietly by, high overhead. And then it buzzed by again a bit more loudly. And then it started to circle the field, low enough now that golden letters were clearly visible on the side. They spelled POLICE. Soon a couple squad cars pulled up and a police officer strode purposefully toward the group. He informed us that the Marine Base had called them about some paraglider pilots in their airspace. They happened to have a helicopter in the area already so it was easy for them to find us. They said they weren't going to do more than take our information, but they suggested we get in touch with the base. I was nervous about contacting the base. Because while we had enjoyed great conditions for staying high above the airspace along the mountains, we had in fact landed in a field located just inside the perimeter, and we had also seen another pilot in our group turn around and head back toward our starting point on a line that was clearly below the airspace ceiling. He was a visitor and didn't quite understand the airspace issues, although that is certainly no excuse. So I could imagine many scenarios for the conversation ahead of me, and very few of them were good ones. It took me a week to make the call. First I did a lot of airspace research, refreshing my knowledge and confirming my understanding of all the issues. I also talked to several fixed wing and helicopter pilots who have had communications with ATC at the base. And then I had to figure out which number on the public marine base directory would be the best starting place. I could imagine having to navigate through a crazy hierarchy of personnel before finding the person who had made the call to the police. Finally I decided to try calling the number listed for the air station duty officer, for lack of any better idea. And he immediately connected me with the right guy, Staff Sergeant Carey! That was quicker than I expected. He explained that they had been running helicopters over the mountains that day, when one of their helicopter pilots reported paragliders in their airspace. A lot of them! They were surprised and they had to reroute their traffic. Since they had no other way to get in touch with us, they called the police to deliver the message. That is a strong way to send a message! On the bright side, they didn't scramble jets to intercept us. The bottom line is they really want us to contact the tower when we're going to be passing by, or over, their airspace. Airband radio contact is ideal but a phone call will work as well. Most of us don't typically fly with airband radios, but I've just ordered one, so I'll have that option in the future. They want us to give them a heads up that we'll be flying near their airspace, including the number of paraglider pilots and the likely duration of the traffic. That way their pilots can give us a bit more lateral clearance. It's also possible that we could request clearance to actually transition through the edge of their airspace if necessary, and if their workload is low enough they might okay it. And if we're going to do that we'll need to learn the radio protocol to make that kind of request. But in the meantime, if we're high enough to stay clear, we can pass by after we give them a heads up that we're flying along the mountains just outside or over the cylinder. 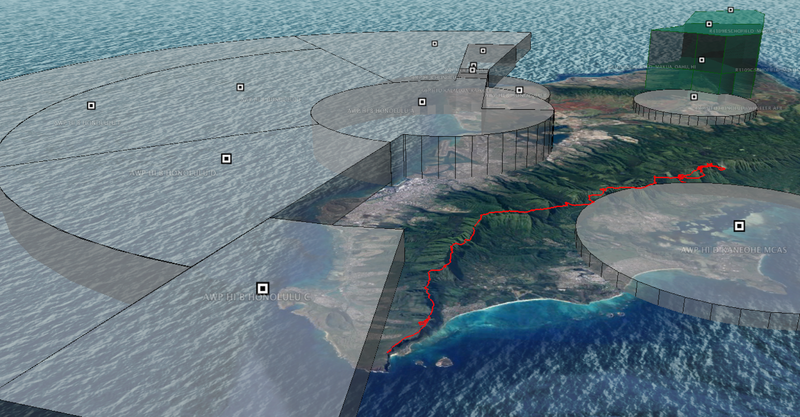 Everyone who is thinking of flying downrange from Makapuu past Kaneohe needs to understand how the Kaneohe airspace works: how far and high it extends, and when it's active. Check out a sectional, or even better, download the shapefiles and load them into Google Earth. The ceiling is 2,500 feet. As I understand it, the airfield (and airspace) is normally closed Sundays and holidays but that's subject to change on any given day or week. Check NOTAMs for PHNG before planning to pass by there on a given day. Ideally we should all be flying with these nice modern instruments that show airspace clearly on a moving map as you're flying. I have a good one on my phone these days. I don't know how I ever stayed clear in the old days without using one! But at least we need an instrument to tell us how high we are, and we need to know exactly where the cylinder intersects the mountains and what line will keep us outside. Thanks for doing the research and making contact with the guys at Kaneohe. I know for me it is important because I want to keep doing what we do. Tour helicopters and small air traffic do cross Kaneohe's Delta regularly, usually it is just a radio call to the clear it. The fact that we are clear to contact the tower is a great thing for our flying future here. Staying clear of Kaneohe's Class D airspace can be hard, it extends up to Haiku Stairs and almost to the ridge on the Temple Valley side. If we have clearance to brush the edge it definitely adds a level of safety on those low cloud days. Fortunately, I fly with an Oudie flight instrument which complains profusely anytime I am even near airspace. I was playing around with my old VX-150 radio that might be modified. While the display flashes in the 120mHz range, which I think means out of transmit range, it transmitted just fine. Another bit of information, the Fire Rescue helicopter and I believe Coast Guard, can be reached on 123.1 mHz. While I would never authorize anyone to use that channel, it could be handy during a real emergency to communicate with the helicopter. Our 2m radios can receive in the aircaft freq. range, and if modified even transmit there, but aircraft use AM and our radios do FM. Many 2m radios have circuitry to be able to receive AM, but they don't transmit it. Berndt, I have to admit that I did not talk on the frequency, I just keyed up and blew in to it. It seemed to work. The receiving radio was an aviation handheld. I will do more research. I am admittedly not very radio savvy. Communication between the tower and aircraft is frequency modulation (FM). According to Google. Alex what program do you use on your phone that shows airspaces? A phone call is all that's needed at this time to let them know we'll be flying along the mountains near the airspace. They'll want to know how many gliders and for how long. It's not hard to stay completely clear of the cylinder on any good day. Since I've focused on staying legit the last couple years I've always been able to fly above or around it, although sometimes just barely. As far as requesting official permission to transition within the edge of the cylinder, as other aircraft routinely do, we'll need a radio capable of AM airband TX/RX to maintain contact with ATC during the transition. I've done a lot of research on radios and modifications and it looks like there's no good solution for just one radio. I don't mind carrying two. I just ordered a Yaesu FT-230 for just under $200 including shipping. Again, I didn't discuss the option to transition inside the airspace with the guy I spoke with, but it should be possible in theory. There's a lot to learn about the protocol for those kinds of requests. In any case I think the airband radio will come in handy for other purposes as well, such as communicating with our friends in the tour helicopters, or giving HNL ATC a heads up that we're flying at Diamond Head or other areas near their airspace. I am using the Flyskyhy app on my iPhone with the airspace extension. I have also tried the Freeflight app with the airspace extension but it's not my preference because it doesn't work with my external bluetooth vario. Hi Guys, Just a thought from an old Coast Guard helo pilot...if you are going to talk to Kaneohe tower via radio you probably should come up with some call sign scheme, probably not your Ham radio call sign, but something akin to an aviation call sign: "Paraglider Ozone 28, flight of 4 heading north at 3,500 feet at (state your location). We've thought of getting on the aviation band here in very busy Juneau, Alaska, but nixed the idea as it would cause more confusion than needed. We do call the tower/FSS via cell phone when planning to fly thru their Class D airspace with no problems. Hope this helps! Gerry from Juneau, cu all first week of April. The Yaesu VXA700 will transmit AND receve BOTH in the amature FM band AND in the AM Airband. Had 2 of them years ago and Quentin had one. Did exactly what you need. But they are rare. As I understood it, Yaesu dropped that particular feature because the FAA wanted the radio to be TSO'd. Don't forget that you need a Restricted Radio Operator permit to transmit over the Airband.